This page shows the advantage of calorie cash™. Just see how easy it is to find foods that make good 600 calorie meals. Further down the page you will find ideas for 625, 650 and 675 calorie meal and other low calorie meals. Of course in reality, you will have to mix and match items from the other pages to come up with a meal plan, but these charts should make it easier. Here is a filling 600 calorie meal that I just ate. 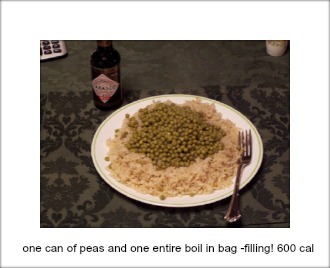 I used a whole bag of boil in the bag rice by Success®, and a whole can of Le Sueur® Peas. Have A Great Story About Foods of 600 calories? Do you have a great story or recipe about meals of about 600 calories? Please share it!